In the collection of old picture postcards recently rescued from the cellar of the Wack Drug Store by Dr. Norman A. Wack for this column, the one shown here is undoubtedly the most artistic and perhaps the most interesting. It is marked ”Golf Links, St. Davids,” and the view shown is one looking from the eastern boundary of what was until recently the Helms estate, on the southeast corner of Lancaster avenue and St. Davids road. Within the past few years the large Helms house has been demolished to make room for the St. Davids Park Apartments, which now occupy all of the Helms property. 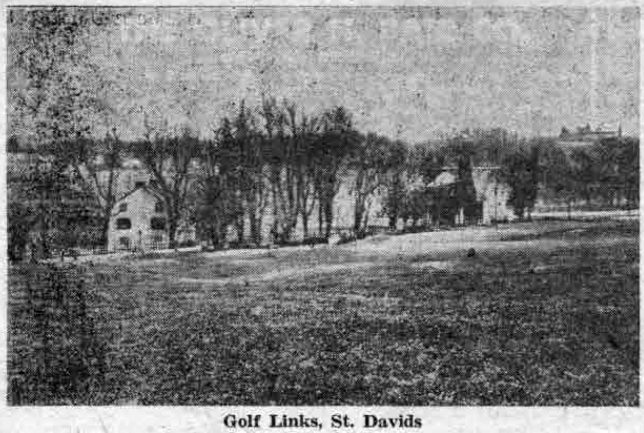 At the time this picture was taken the land on either side of Lancaster avenue, now the Main Line Golf Club, was occupied by the St. Davids Golf Club, now on Radnor road north of Wayne. The white stone house to the left in the picture, which probably dates back to the time of the early Welsh settlers, still looks very much as it always has. On the southern side of the Pike, where it intersects Iven avenue, a war memorial has been erected to the memory of those from Radnor township who died in World War I, and in the middle background, partially hidden by trees, is the site of the new Rowland School and the nearby Wyeth Laboratories. To the extreme right, in the distance, several Villanova College buildings are just visible. But to many who will see this old picture, the fondest memories of all will be stirred by its immediate foreground, which marks the foot of the old golf links hill, the best spot for miles around for sledding, as the youth of many generations can well remember! The above picture shows Poplar avenue as it appeared soon after its first houses were built, a matter of almost 50 years now. The double houses on the right still look about the same, as do the individual homes on the left. 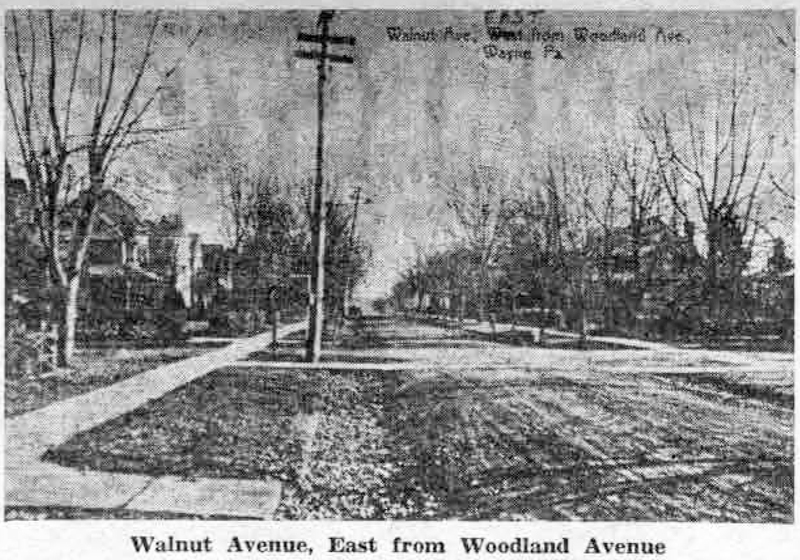 At that time the street had not been paved, although good sidewalks had been laid. In the intervening years since the picture was taken, many smaller places have been built beyond the double houses on what was then the property of Dr. George Wells, one of the best-known Wayne physicians of his time. Many of the homes shown in this picture were Wayne estate houses that date back to the middle eighties. 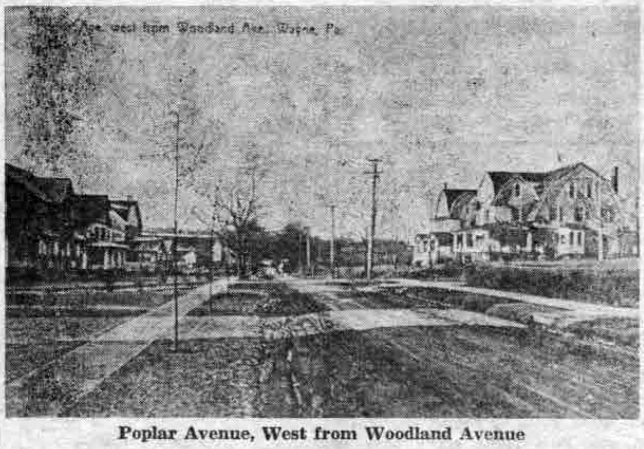 Since the street was built up so solidly even then, and since the houses were so sturdily built, there has been little change from the time the postcard was printed, except that a few houses have been remodeled, the street has been paved, and the trees have greatly increased in size. The collection was turned over to your columnist by Dr. Wack when he was asked what had become of the many postcards of local interest which had once been on sale at the Hadley Drug Store, predecessor of the present pharmacy. The Wayne sanatorium was a cottage colony for tubercular patients, located on part of what is now St. Davids Golf Course, when all of that section was known as the Henry Farm. The three-story house shown in the background of the picture faces Gulph road, and was at that time the home of John Henry. The sanatorium, which was directed by a woman, may well have been patterned after the famous Trudeau Sanatorium, at Saranac Lake, N.Y., an institution pioneering in the use of “curing cottages” for small groups of tuberculosis patients. 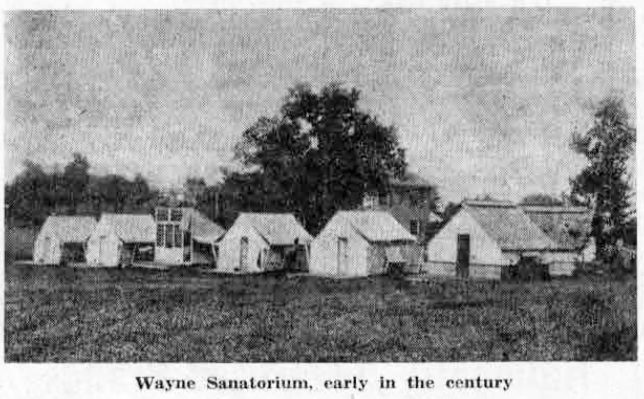 A close study of the picture of the Wayne Sanatorium seems to indicate that its cottages were almost tent-like in construction. Dr. Wack recalls that as an errand boy for the Hadley Drug Store, he often went out to the sanatorium to deliver medicine to the patients. On these trips, which were made on a bicycle with a small basket tied to the handle bars, he often saw the invalids sitting in chairs in front of the tents, basking in the sunlight. For some reason, or perhaps for many reasons, this venture in “curing cottages” was a short-lived one. Perhaps its owner found that the air was not at all the same as at the Adirondack resort, and certain it is that she met with many objections from those who lived in the neighborhood. And so the tuberculosis colony was closed, with this post card perhaps one of the very few records that it ever existed. As we sat at the desk in Dr. Wack’s office in the back of his pharmacy and looked over these old views of Wayne, we asked him why he had discontinued the sale of local postcards. It was, he answered, a matter of the cost of making them. Some years ago pictures taken locally could be sent to Germany for reproduction at such a low figure that the cards could be sold at retail for a penny apiece. As the years went by the price rose to five cents, with a consequent dropping off of sales, and, eventually, the disappearance of the postcard rack from its familiar place on the counter. What was left of them was relegated to a box in the basement, where they stayed until their recent rescue. The address side of this particular postcard is marked “The Rotograph Co., New York City. Printed in Germany.” The majority, however, are marked “C.W. Bensinger. Printed in Germany.” The name “Bensinger” brings back to Wayne’s old timers many memories of the small store, once housed on the premises of the present Wack Pharmacy, which was then located where the M-R Shop now stands. For some years it was run by Mr. and Mrs. Bensinger and their daughter, Helen. Primarily, Bensinger’s might have been called a stationery store, but its stock of small articles was about as diversified and inclusive as that in the Miller store which many, even comparative newcomers to Wayne, remember when it was located in the present Cobb and Lawless site. On the Bensinger counter one could even find firecrackers in the proper season. After the Bensingers had vacated the shop, the American Stores had a branch there for a short time. They were followed by Master’s Meat and Grocery Store, which suffered a disastrous fire in the ‘30s. The morning after the fire, Norman Wack bought what was left of the building and remodelled it for rental purposes. It was several years, however, before he moved to his new location.